If you are getting a scale build-up in your recirculation system from your manure holding ponds (lagoons), calcium carbonate or struvite (magnesium-ammonia- phosphate) crystals, there is a solution to solve your scale problems. 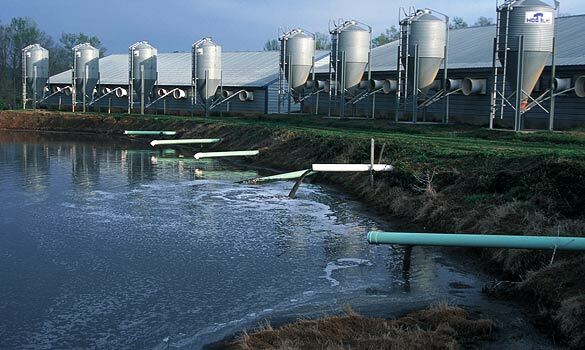 In some CAFO sites, they will use anaerobic lagoons to reduce the amount of manure that they need to treat. In a zero oxygen environment the anaerobic bacteria will take the manure which is loaded with nutrients and further digest it to generate methane, hydrogen sulfide, ammonia, phosphate and other mineral salts (calcium and magnesium). When recirculation from lagoon to lagoon, struvite will gradually form and start to block valves, pumps and pipes. On a dairy farm in Neb. that operated with 15,000 milking cows, they were generating 500,000 gal per day of wastewater laden with manure. Over the summer, they noticed a reduction in their pumping capacity because the first lagoon was filling faster than they could pump. On a closer examination, they found scale. First they tried a little sulfuric acid and it foamed a lot but the scale was still there. Then they tried muriatic acid with similar results. Finally they tried a struvite removal chemical. It removed the scale and slowed the reformation. A wastewater treatment plant near Flagstaff, AZ was experiencing problems with keeping their belt aligned on the belt press. The belt press was in operation 4 days per week for 6 hours per day. The flow rate was 150 gallons per minute (gpm). Upon close inspection of the belt press system, the maintenance staff observed scale deposits on the rollers, pan and filtrate lines. Samples were taken for analysis. The lab report indicated that the scale deposits were composed of magnesium, ammonia and phosphate, which is struvite. They took five (5) one gram samples of the struvite deposit and one inch squares of the belt cloth to soak in 100 ml for 24 hours. From these five tests, they found that Struvite Remover had the best performance. They ordered 5 gallons for additional testing on the belt press. For the plant trial on the belt press, they make up a 50% solution of Struvite Remover and used a 3.5 gallon garden sprayer to deliver the dilution of product. Thirty minutes prior to shutting down the system they sprayed the 50% solution on the belt cloth, rollers and belt press pan. In the morning, they would run the rinse cycle for 10 minutes and start up the dewatering cycle. 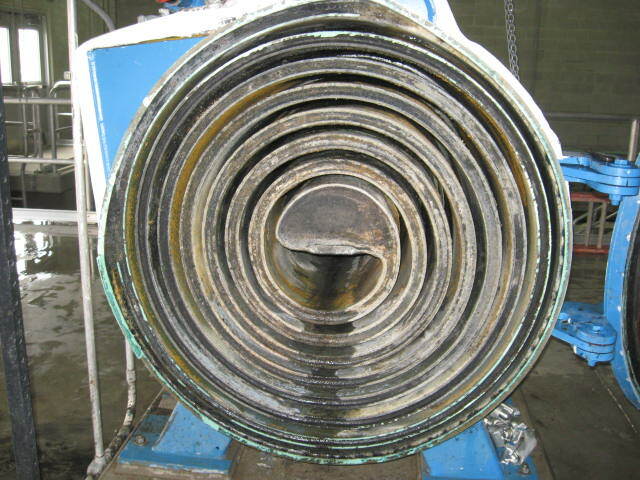 After 5 operating days, the struvite deposits on the rollers had disappeared. Struvite scale on the belt press pan and wet areas started to disappear too! The overall operation of the belt press improved. They saw drier cake and used less polymer per dry ton. It looked liked the belt cloth was draining better, which meant the old polymer films were being removed too. Upon completing the plant trial, they installed a small metering pump on a timer to feed Struvite Remover on the belt press at the end of the operating day. They no longer have a problem with the belt going out of alignment due to struvite deposits. A regional wastewater treatment plant in Sonoma County was experiencing problems with struvite on their screw presses and vivianite on their heat exchangers. The design plant flow rate is 7.9 mg/day. They were using 7 mg/L to 10 mg/L (dry basis) of ferric chloride to control hydrogen sulfide and improve solids removal in the primary clarifier. The plant maintenance staff was forced to shut down the dewatering process every three (3) weeks to clean because of struvite deposits on the screen of the screw press. They also notice that they were having a difficult time maintaining the temperature in the anaerobic digester. Upon inspecting all the heat exchangers, the maintenance staff noticed a purple metallic deposit that was over 0.75 inches thick. A sample of the deposit was analyzed and it was determined to be vivianite scale deposited on the surface of several heat exchangers. The maintenance supervisor obtained several cleaning compounds in an attempt to clean the heat exchanger and screw press. The plant supervisor wanted a product that was environmentally safe for disposal and could quickly remove vivianite and struvite - Struvite Remover was selected for use. The plant staff obtained an 8 oz sample of Struvite Remover and had the lab supervisor run a test to see how fast it would dissolve the deposit. The lab supervisor took a 5-gram sample of vivianite and struvite and placed them in separate beakers with 100 ml of Struvite Remover. After 25 minutes, the samples of vivianite and struvite were dissolved in the beakers. The lab supervisor then ordered a 5-gallon pail to run a larger test. This time they soaked a six inch (6”) diameter valve that encased in struvite. After 24 hours, the valve looked like it was brand new and was free of any traces of struvite. Based on the lab supervisor’s recommendation, the plant ordered two 55 gallon drums for a plant trial on the screw press. They set up a spray system to meter on the outer surface of the screw press. During the first five (5) days of the struvite removal trial, plant operations noticed that the openings on the screens were getting cleaner. They reduced the cleaning cycle from continuous spraying to 30 minutes of spraying at the end of operations each day. Plant operations observed that the screw press’ cake solids were higher and they had a lower dosage of polymer per dry ton. Plant operations deemed the trial a success. On the vivianite-laden heat exchangers, the maintenance supervisor created a recirculation circuit and diluted product to a fifty percent (50%) solution. They recirculated the diluted solution for 48 hours while raising the temperature of the solution to 110F. Upon opening the first heat exchanger, they observed a purple solution following by a half-inch (½”) sheet of vivianite scales popping off the surface of the heat exchanger. They made up another solution and repeated the cleaning cycle. After the second cleaning, they returned the heat exchanger back to service. They were able to heat the digester and control the temperature while reducing their heating cost. As a result of using our product, the screw press operation improved due to cleaner screens. They had a drier cake using less polymer per dry ton. The operation of the digester improved based on operating at a higher temperature. The plant saw an increase in methane generation. The sludge from the digester dewatered easier. The spent solution was comprised of iron phosphate, magnesium phosphate, ammonium phosphate, chelated magnesium and simple sugar compounds, which was discharged to back to the headworks of the plant. This spent solution is highly biodegradable. There is no major drawback from extra handling or offsite disposal, which other acids or removers can require. Wastewater plant feeding Struvite Dispersant into the sludge holding tank (100,000 gal) prior to dewatering in a screw press. They are getting a slight build up on the screens but have been using a 10%HCL spray to control struvite. They were having a problem with the sludge pump wearing out because of the abrasion from the struvite crystals in the sludge cake. Using Struvite Dispersant, they have reduced the size of the struvite crystal and its formation. Their flow rate is 30,000 gal per day to the sludge holding tank. They increased the dose to 2.5 gal/day from 2.0 gal/day. This is close to 90ppm recommended for our Struvite Dispersant.